Do you program? Do you write code? Depending on what you're programming or trying to create, you'll need a programming language and depending on the task at hand the decision will need to be made of using an interpreted or compiled language. Think about it like this, when you read a book, you read it line by line. An interpreted language does the same kind of thing. It reads the code in a file line by line. Immediately after that line is read, the program reading the code (the interpreter) runs that line of code then moves on to the next one. This is typically done for platforms such as the web. A compiled language is slightly different. A compiled language would read the entire file of code, and translate it to another format (ex. machine code or another language). This is done by a compiler. Once the code is in another format it can be run. These types of languages are usually used for native desktop or mobile applications. There is a mix of interpreted and compiled languages that is continuously growing. 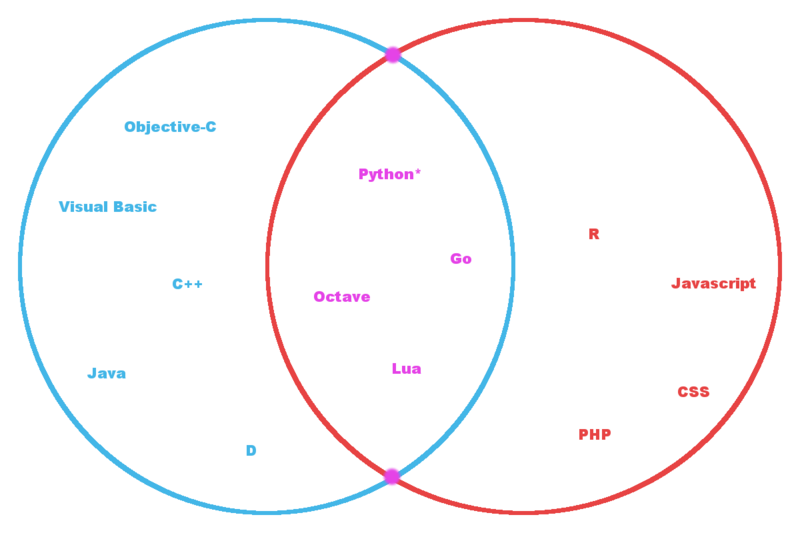 Just to show how spread out this is, take a look at the venn-diagram below. Lastly, check out this video that I think explains this concept really well. It’s mentioned all the time in the news and companies are constantly touting how enhanced their applications are with learning machines. But what does that really mean? To put it simply, its teaching a machine how to do something. There’s more than one way to do this but most models follow the same method of “Practice makes perfect”. For example, if I wanted to learn how to draw, I would start with the basics and do simple things. I would practice the motions and gestures that I wanted to get the desired effect. The more I practice, the better (in most cases) I would get. My skill would improve over time. However I could be learning the wrong way and actually be making my drawing ability worse. Using computers to analyze data and find patterns in large datasets is achieved with Machine Learning. However, there are different ways that data can be observed. Classification - Looking at elements in a dataset and determining what category the element belongs to, based on preset parameters. Imagine that I worked in a post office and I had to sort mail into different categories, Packages and letters. The only information that I am given is the weight of the mail. Based on the weight of the incoming mail, a model can be built so that mail can be classified as a package or a letter.